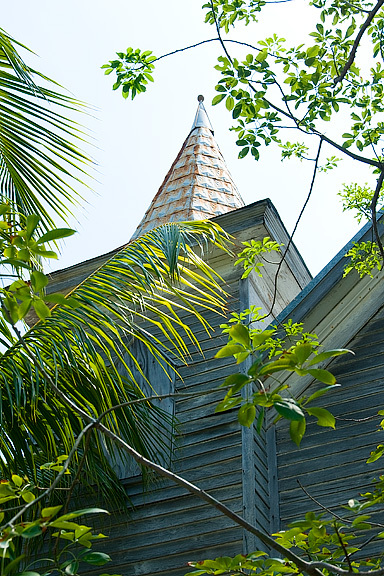 Not all the buildings in Key West have been restored. This church,	for	instance,	is	in a sad state of disrepair. Perhaps one could get a deal on this property. As I recall back in the 60's, some counter-culture types bought old churches and turned them into homes or communes. Of course with the price of property in Key West, I doubt that any current-day counter-culturists could afford this church. 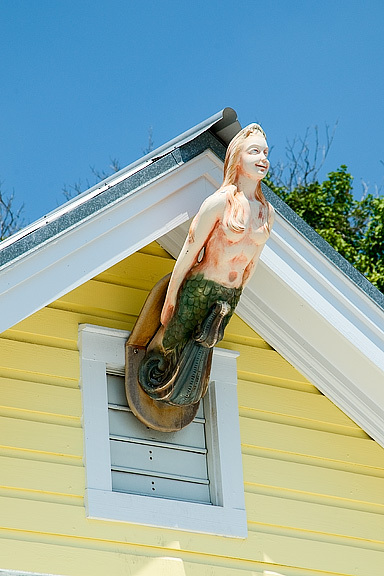 As I continued to wonder about, I was initially surprised to see a ship's figurehead attached	to	this	house. But when I thought about it, these islands used to be accessible only by sea and many of its inhabitants were seafaring folk. So I guess it is right in character. It seemed as if every time I turned around, I found another building of	historic	interest. 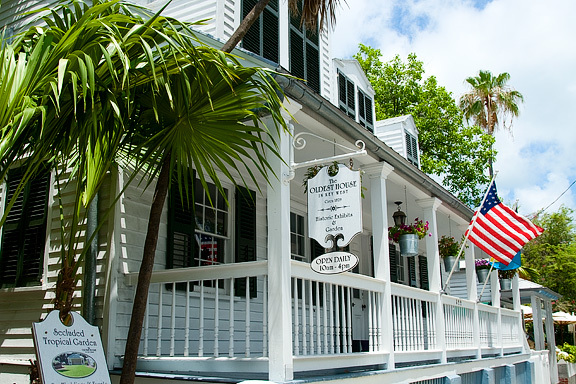 Here	is the self-proclaimed oldest house in Key West and, in fact, the oldest house in South Florida. It was built in 1829 and for decades was the home of Captain Francis Watlington. Among his occupations was "wrecker" — one of the folks who salvaged goods from ships that ran aground on the reefs around Key West. I was told that these same folks often extinguished the beacon in the lighthouse to increase the probability of such shipwrecks. The house is now a museum. I turned around again and encountered the southernmost house in Key West. 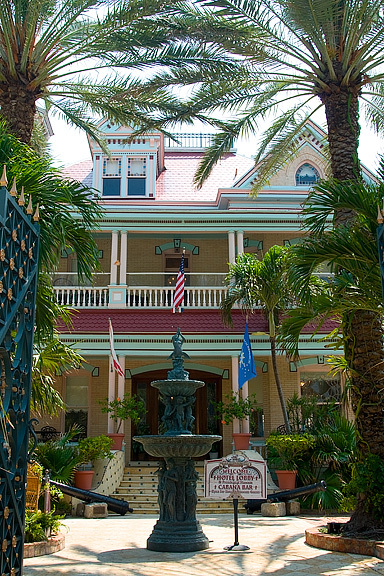 Not only is it the southernmost house in Key West but also the southernmost house in the continental United States. Of course, everyone knows that Hawaii is the site of the southernmost point in the United States — South Point on the Big Island (yes, of course I have been there). 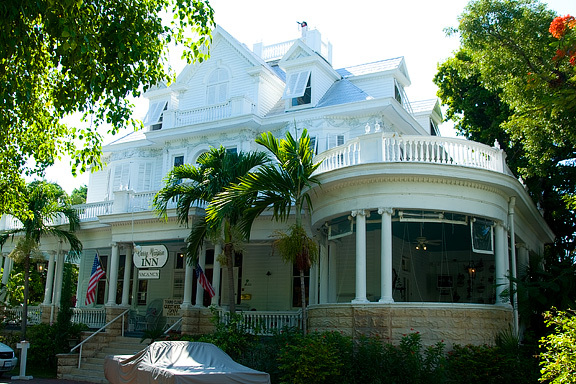 Back to Key West, this house was built in 1896 for a cost of $250,000. Imagine what this is in today's dollars — undoubtedly many millions. It was originally built as a residence and has served multiple purposes but was converted back to a residence until 1996 when it was restored as a 13-room hotel with a museum on the first floor. The house is an architectural treasure and I regret that I did not have time to explore it thoroughly. Many of these old homes and mansions have	been	converted	into	hotels and bed & breakfast establishments. 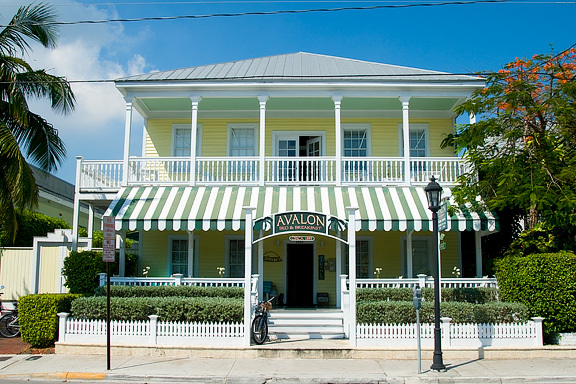 This one, the Avalon B&B, was built in 1895 has been lovingly (so they say) restored to its Victorian origins. There are so many of these fine restored structures offering rooms that it would be a real treat to spend a week or so in each one — so you could settle on your favorite. Of course, that might take a year or more. So? The Curry Mansion is one of the more famous such	establishments. It	was	built in 1899 and was voted #64 on Conde Nast's 2006 list of the 100 best hotels in the US. The house was named for William Curry who was one of the "wreckers" mentioned above. He arrived in Key West penniless and became Key West's first millionaire (back when a million dollars was worth something) and thus was nicknamed "rich Bill". They claim that Key Lime Pie was first created at the Curry Mansion kitchen by the Curry's cook, Aunt Sally. Some historians dispute this claim, suggesting that it was a delicacy created by area fishermen. In 2006, Key Lime Pie became the official pie of the state of Florida. Sounds like those Florida legislators have entirely too much free time. 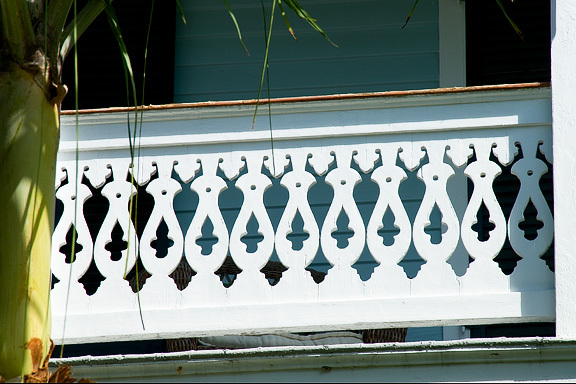 One of the interesting architectural	features	of	the	Curry Mansion is the "widow's walk". 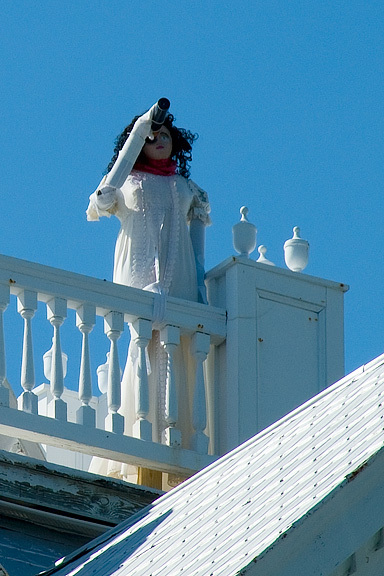 The name comes from wives of sailors who would use a high perch on their homes to watch for arriving ships to see if their husbands were returning home. Of course since sailing was a dangerous profession, many of those sailors would not return — but many widows would continue to watch, hoping against hope that their husbands had somehow survived and would be turning up any day. 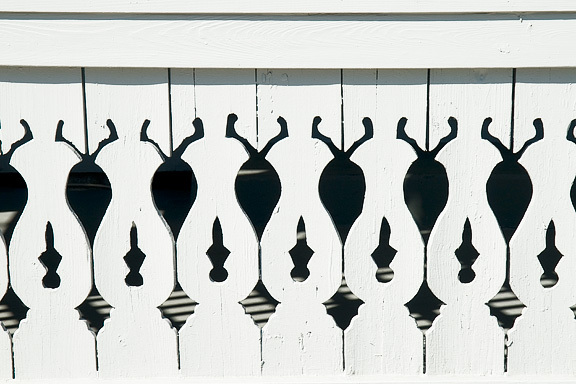 As you stroll around Key West, you see any fine examples of gingerbread	— ornamentation on building that is primarily for aesthetic appeal with minor functional purpose, if any. 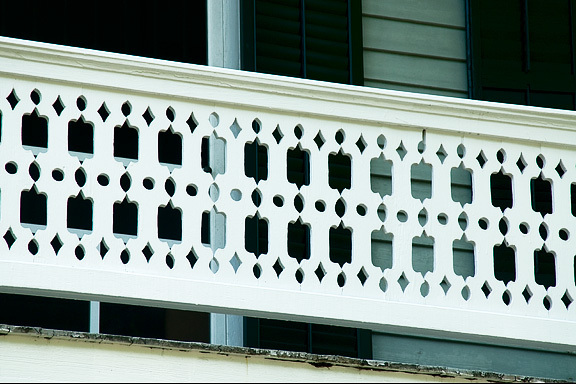 We were told that in Key West, many of the patterns had to do with vocations or avocations of the home owners. 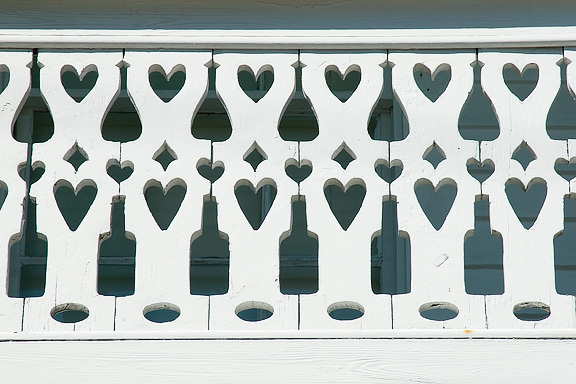 This gingerbread pattern was from the time of prohibition — I'm not sure if the owner was a bootlegger or just longed for some wine and beer. 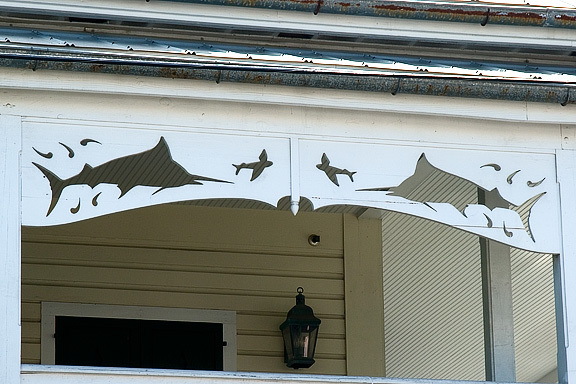 This	one	would	be	easy to guess — the owner must have been a deep sea fisherman. This pattern is less clear. My guess is that the outlines are industrial size spools of thread that would be used in weaving cloth. Your guess? And this one could be a poor imitation of the first one above — or the owner could be a radish farmer. Regardless, it is fun to observe and guess the meaning of the numerous examples of gingerbread you find in Key West.